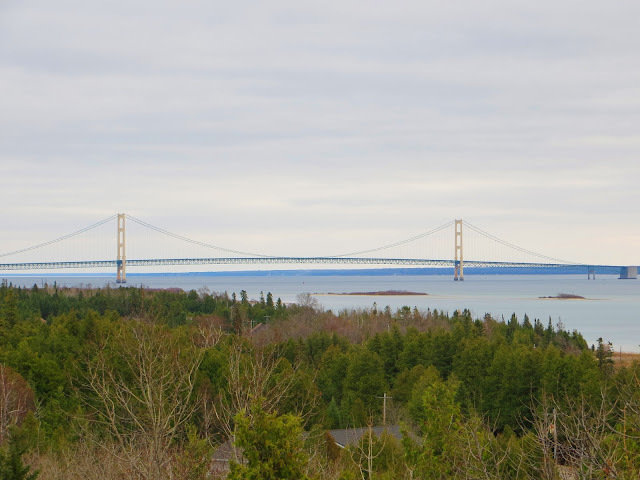 That said, we got this photo of the Mackinac Bridge, which connects the upper and lower peninsulas of Michigan, at a little rest area pull-off just before we hit the toll booth. At five miles long, it's the third longest suspension bridge in the world, and the longest suspension bridge in the western hemisphere. I have a thing for bridges - being so high up, seeing the views and all the water - I also fear plunging off the edge, but I rarely think of that part. 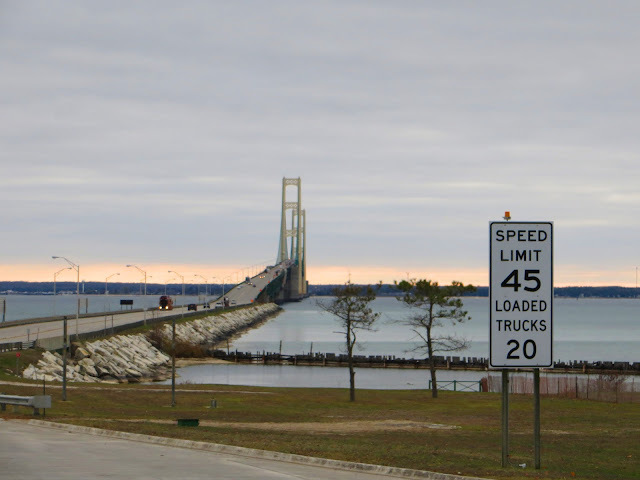 This is the only bridge we've ever been on that requires trucks to drive twenty miles an hour. It was actually quite peaceful, that pace. I wish they'd have a twenty mile an hour speed limit on the George Washington Bridge, or even the Tappan Zee. I don't like all those people whizzing by me when there's so much traffic and so much room for operator error - theirs, not mine. Our load picked up in the city that anchors the southern edge of the bridge - Mackinaw City (which is actually a village, not a city) - pieces of a dismantled water park heading east. Ed promised me that we'll come back, another time when the weather is a little prettier and the tourist spots aren't closed for the season. I've been wanting to visit Mackinac Island and the Grand Hotel ever since I saw the movie "Somewhere In Time" back in the eighties. I need to sit on that 660 foot front porch! No, Not Harry Potter. GRACE Potter. Who Doesn't Love A Sunset?